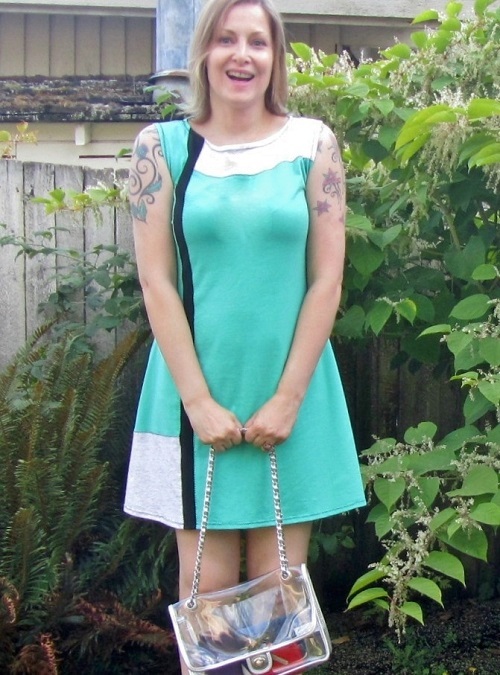 I’m so happy with my new minty green mini dress. I love mod, 60s-inspired designs and fell in love with the Mondrian-esque color-blocking on this number. I was lucky to stumble into a pop-up shop when I spent the day in Chelsea last month and when I saw the dresses in the Lois Eastlund display, I had a hard time deciding. So I picked two: this summer sale number and a blue and black shift from her fall line. Even though this is a summery style, I plan on wearing it with a cardi and knee-high boots when the weather cools. For today though, I paired this shift with my polypropylene wedges–they’re stretchy like a Body Glove swimsuit! Luckily Seattle is experiencing one last heat wave before fall hits so I can continue enjoying my summer clothes. Are you clinging to summer or have you switched into autumn wear? Oh, I’m linking up with the Style Informant today. Check out what everyone else is wearing! Gorgeous. You look wonderful in this dress. It’s so much fun, especially with the clear bag! Thank you! I have no secrets today (not with a see-through purse!). I thought it added to the 60s vibe. Thanks for visiting! Great dress. There’s just something about a fun colour like minty green when combined with black and white accents that makes it look terrific. Very retro. Thanks Brian! I feel like the black and white accents gives this dress more possibilities than a solid mint dress. I can tie it into my accessories and wear dark or light accents for a winter or summer look. Thanks for commenting! I agree, this dress would not be the same if it was just minty green. The design in black and white makes it very special and turns ordinary to extraordinary! 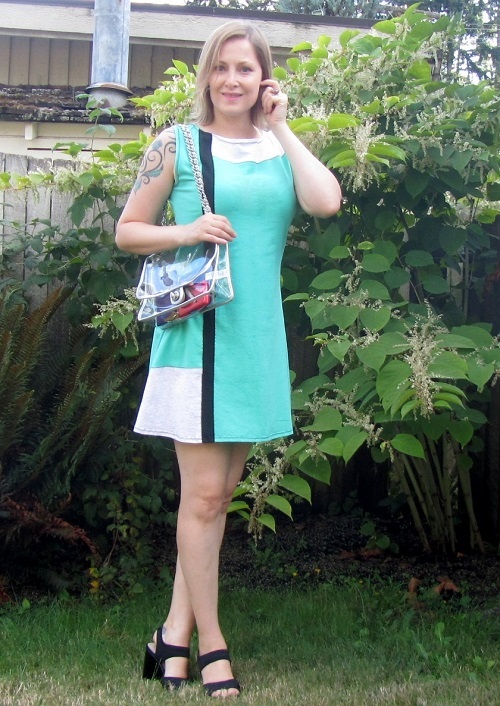 This dress is soooo 60s (I aughta know, I lived it) with an updated look–totally mod!! Lois has amazing designs! You look fabulous!! Love the colour on you and the purse is fun. It would be a challenge for me to make sure it’s tidy! Thanks! I love her designs and that I’m supporting a small design house (and a vegan to boot!). I’m planning to get a long-sleeve dress for winter. They’re so comfortable and chic!